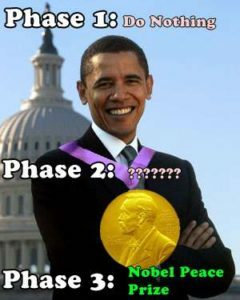 Home BusinessAccounting Nobel Peace Prize For Obama: Is It Happening Too Soon? Soon after, the White House was abuzz with excitement. President Barack Obama was awakened immediately by a telephone call from Robert Gibbs, the White House press secretary, and was said to have been “very surprised” on hearing that he has been declared the winner of the Nobel Peace Prize for 2009. Amidst cries of it happening too soon, the President agreed to accept the Nobel Peace Prize that the Norwegian Nobel Committee decided to confer on him. He said that he was “surprised and deeply humbled” by this decision to award him the peace prize. According to the committee, it honored Obama for his “extraordinary efforts to strengthen international diplomacy and cooperation between people,” but the President said that he views it more as a “call to action” rather than recognition of his accomplishments. Is this happening too soon and does he deserve it? Is it more of a burden for the President than glory? These are the questions being raised from all quarters. Obama is the fourth US president to win this prestigious prize and the third president in sitting to do so. The other sitting American presidents were Theodore Roosevelt in 1906, Woodrow Wilson in 1919 and Jimmy Carter in 2002. Republicans feel he won this more for his oratorical skills and star power than for any achievements. Chairman of the Republican National Committed said, “The real question Americans are asking is, ‘What has President Obama actually accomplished?’” The Democrats also privately wonder if he deserved it. While most world leaders expressed surprise, former Nobel peace laureates were more tolerant and viewed it as an encouragement for President Obama to handle all the issues he has been discussing on world stage. They feel this will work as a reminder and prod Obama along when he hits any hurdles on his path towards peace. The President will travel to Oslo to accept the award on Dec 10 and will donate the $1.4 million prize money to charity. There have been people who thought that respect for the President would have increased by leaps and bounds if he did not accept this prize. Observers note that Obama did generate a lot of goodwill overseas, and became hugely popular. He has vowed to pursue a world with no nuclear weapons; reached out to the Muslims; sought to restart peace talks between Israel and the Palestinians. But all this is just in the beginning stages, as he had to concentrate on the economic crisis and other domestic problems first. Obama’s supporters hope that the prestige of being a Nobel peace laureate strengthens the president’s hand in the health care reform debate. They are of the opinion that in a world where people were pushed around by the Bush administration, this peace prize seems to be wrapped in gratitude for his willingness to listen and negotiate, as well as taking a stand on nuclear disarmament and climate change. Forget Artificial Implants: Use Your Own Fat For Better Assets!